Constrained Optimization Problems (COP’s) are encountered in many scientific fields concerned with industrial applications such as kinematics, chemical process optimization, molecular design, etc. When non-linear relationships among variables are defined by problem constraints resulting in non-convex feasible sets, the problem of identifying feasible solutions may become very hard. 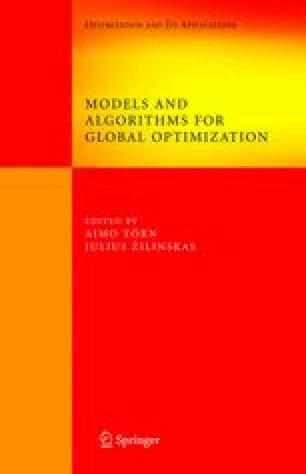 Consequently, finding the location of the global optimum in the COP is more difficult as compared to bound-constrained global optimization problems. This chapter proposes a new interval partitioning method for solving the COP. The proposed approach involves a new subdivision direction selection method as well as an adaptive search tree framework where nodes (boxes defining different variable domains) are explored using a restricted hybrid depth-first and best-first branching strategy. This hybrid approach is also used for activating local search in boxes with the aim of identifying different feasible stationary points. The proposed search tree management approach improves the convergence speed of the interval partitioning method that is also supported by the new parallel subdivision direction selection rule (used in selecting the variables to be partitioned in a given box). This rule targets directly the uncertainty degrees of constraints (with respect to feasibility) and the uncertainty degree of the objective function (with respect to optimality). Reducing these uncertainties as such results in the early and reliable detection of infeasible and sub-optimal boxes, thereby diminishing the number of boxes to be assessed. Consequently, chances of identifying local stationary points during the early stages of the search increase. The effectiveness of the proposed interval partitioning algorithm is illustrated on several practical application problems and compared with professional commercial local and global solvers. Empirical results show that the presented new approach is as good as available COP solvers.